In a recent blog post, I talked about the monetization of well architected solutions. Here I am going to put some hard values against it. I used the following variables to come up with the data to put into the chart. Time required to duplicate this functionality once (non architected solution): 15 mins (assuming the user is somewhat familiar with the code and is copying and pasting) – I would comfortably say it could take 30 mins for someone who isn’t quite sure how the code worked to begin with and therefore not knowing exactly which code is required to be copied – this would double the blue time line as shown on the char below. 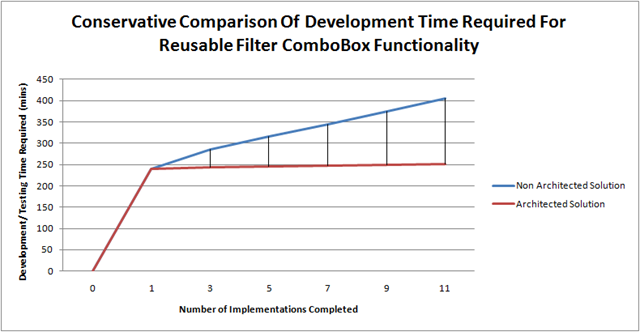 These numbers were taken from the time it took to actually do the implementation several time. The 15 mins value required to duplicate the functionality for the non architected solution was derived from practicing a copy and paste scenario to integrate code to add the functionality required. This does not account for the extra effort required in the future to maintain the code or make updates and enhancements. With the well architected component you have to make an update somewhere in 80 lines of code to fix a bug or add an enhancement. In the non architected version, you would be making a change within (80 x N) lines of code where N is the number of implementations. Let’s say 10 – so we’ve got 800 lines of this code that essentially do the same thing over again that need to be looked at to make a code change! Plus all of the other application code intertwined within it that you have to ignore. This is just one example! There are great architectures all over the place and we all (mostly) know how valuable they are. Other than just saying “Yeah, they save tons of time..”, I’m here putting some hard values against it. This is one scenario, but there are many more scenarios that save even more time – I’d even say, exponentially save more time! This is great. Nice to see a value put to it like you said. Not just yeah, it saves time. If you look at the example you are saving 2.5 hours on the project simply by reusing something that is well architectured. Goes way beyond that, like you mentioned with upgrades or maintenance, but even debugging, and troubleshooting times will be way cut down. If you ask me, it is invaluable, and something that I tried to teach many developpers that I have worked with, would have saved them alot of time and trouble, and me plenty of time supporting it. One particular example comes to mind where it was such a horrible mess, in the solution I implemented such an idea, but it cost the company 40 hours of support, pushed back other things I would be supporting and not to mention all the problems that plagued the software that prompted me to look at it in the first place. Good post Dan, hope many add it to their development standards.